I was looking for a particular photo the other night (the one of my girl enjoying fondue at her 13th birthday party in my previous blog post), and got caught up looking at pictures from a few years back. The photos I was looking at weren’t taken all that long ago really, but what a difference a few years can make. We watch our children laugh and cry and sleep and eat and play and do homework and toss a ball–but in the day-to-day, the changes are barely perceptible. 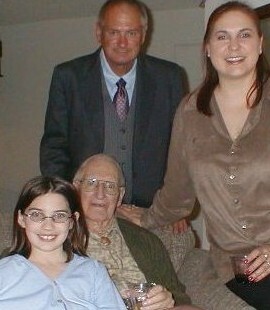 My grandfather, John McAuliffe (Pasee), has often said he can’t believe it’s really him when he looks in the mirror. He still feels like a young man, inside his head, and that reflected image can startle him. Today he’s 96, and if anyone is going to live to 100, it’s Pasee. (I’m so pleased to have the good fortune of his genes!) 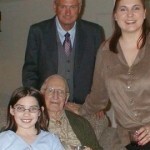 I found this photo from my Pasee’s 90th birthday party–four generations of McAuliffes pictured there–and was surprised at how much Pasee looks the same today, and how much my daughter Alienna doesn’t. Ali is Jack’s only grandchild. This summer she got her driver’s license, and the very first thing her grandfather said in congratulating her was that she can get her pilot’s license now–Jack is a licensed pilot and is eager to share his love of flying with her. 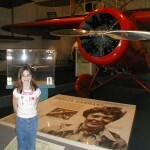 So I went looking for that photo I took of Ali at the Air & Space Museum in D.C. with Amelia Earhart’s exhibit when she was about 11 years old–here it is. Yes, that little girl is now signed up for her first flying lesson next week, compliments of Jack. And that 13-year old with the fondue fork, now a licensed driver? She went to her junior year homecoming dance tonight. As I was watching this poised young woman smile and glow as the flashes from all the parents’ cameras popped, I pondered, where did my little girl go? She has grown up before my eyes, and yet I swear I didn’t see it happening. I am savoring this year in particular–because I don’t have to say it’s the “last homecoming” or the “last” anything yet, like so many of my friends with children who are seniors. This is the year Ali is beginning her college search, and she’s already talking about visiting schools in California and Virginia. I don’t know where she’ll end up, but I can tell you this: that girl’s got wings. And the sky’s the limit. That was my thought, exactly, Ali!!!! Renee, this is lovely, and it brought a tear to my eye. Once again, a “heartwarming slice”….definitely a book in this somewhere, Renee!